The scheme, which is similar to MGNREGS, is an employment-of-last-resort programme in order to provide minimum livelihood security to the poorest of the poor in the urban areas in absence of enough employment opportunity in the economy. In the midst of increasing unemployment in the country, along with Mahatma Gandhi National Rural Employment Guarantee Scheme (MGNREGS) for the rural poor, the state government of Kerala has an interesting employment-of-last-resort programme for the urban poor as well – Ayyankali Urban Employment Guarantee Scheme (AUEGS). Just like MGNREGS, this is also a demand driven programme - the scheme is implemented by the Directorate of Urban Affairs, Government of Kerala. The website says, “AUEGS aims at enhancing the livelihood security of people in urban areas by guaranteeing 100 days of wage-employment in a year to an urban household whose adult members volunteer to do unskilled manual work. This also aims to provide a strong, right-based social safety net for the people in the urban areas of Kerala by giving a fall-back employment source, when other employment alternatives are scarce or inadequate. There are lot of limitations vis-à-vis the design and implementation of the scheme, however, the scheme is in place in order to provide minimum livelihood security to the poorest of the poor in the urban areas in absence of enough employment opportunity in the economy. By urban areas it does not only mean the cities but, the urban areas would include all municipality and corporation areas. 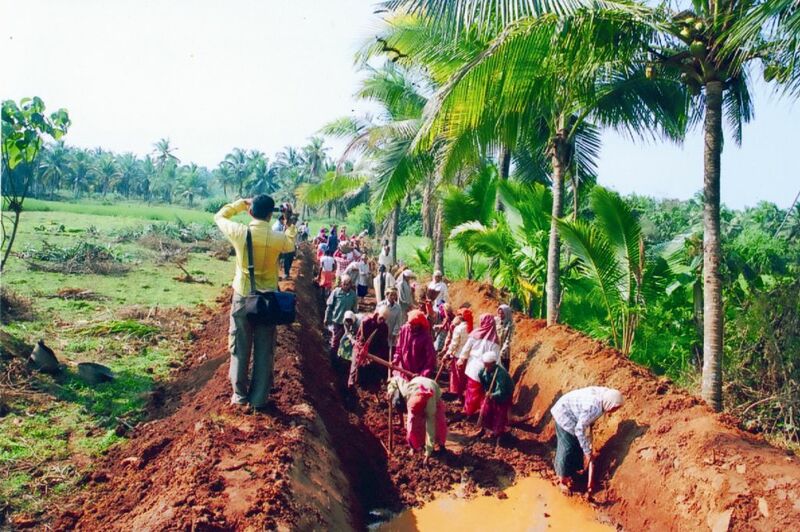 Since, MGNREGS is implemented through Gram Panchayats only, all areas outside the Panchayat areas come under the coverage of the AUEGS scheme in Kerala. The adult members of every household who reside in urban areas and are willing to do unskilled manual work may register their names with the municipal-corporation/municipality, in the jurisdiction of which they reside. Following the procedure under AUEGS, the municipalities or corporations shall issue job cards to all workers who register under the scheme within 15 days of registration. Every Adult member of a registered household whose name appears in the job card shall be entitled to apply for unskilled manual work under the scheme for as many days as the applicant may request, subject to a maximum of 100 days per household in a given year. Just like the MGNREGS, the applicant shall be provided unskilled manual work within 15 days of receipt of application or on the date he/she seeks work in the case of advance application whichever is later. Priority shall be given to women in such a way that at least 50% of the beneficiary shall be women. Applicant for work will be given a dated receipt. Applicants who are provided with work shall be so intimated in writing and by a public notice displayed at the office of the urban local body. As far as possible, employment will be provided within a radius of 5 kms of the residence of the applicant. In case employment is provided outside such radius the workers shall be paid 10% of the wage rate as extra wages. As of now, the wage rate in this scheme is equal to wage rate under the MGNREGS (Rs.271 per day in Kerala in 2018). However, since the average cost of living is relatively higher in the urban areas (that is why there are two poverty lines for each state separately for rural and urban areas), the wages under urban employment guarantee programme should also be higher than the MGNREGS wage rates. Water conservation and water harvesting, drought proofing (including afforestation, tree plantation and greening activities), micro irrigation works, provision of irrigation facility to land owned by households belonging to Scheduled Castes/Scheduled Tribes and to land belonging to BPL and beneficiaries of Centrally Sponsored Scheme, renovation of traditional water bodies including desilting of tanks, land development, flood control and protection works including drainage in water logged areas, supplementary works in clusters, renovation works in colonies, clearing of debris/waste accumulated in public places etc. Works related to formation, metalling, tarring and repair of roads, buildings and bridges are prohibited under AUEGS. However, there is an urgent need of bringing more work, as per the need, under this scheme that are more suited for urban areas. More importantly, there is also an urgent need of such an employment-of-last-resort programme in the urban (municipal and corporation) areas like AUEGS in the whole country. When urban unemployment is on the rise, it would work as a buffer not only for food security and livelihood but also for the aggregate demand during demand-depression and when unemployment is lower and wages are better, automatically the demand for these jobs would come down. Through Keynes-Kahn multiplier process, these jobs would generate further employment opportunities. The present LDF government of Kerala should pay more attention to make this extremely important scheme more effective. Urban unemployment in Kerala is one of the highest in the country but, demand for AUEGS jobs is paradoxically extremely low as of now. Along with the issue of low wage rates, there are serious issues regarding the present design of the scheme and its implementation in all the corporation and municipality areas. However, further criticism and discussion about improvement of a scheme can only be possible when it exists. The need for such a scheme in all the states in India gains more significant in the present context of rising disguised as well as open underemployment and unemployment in both rural and urban areas. But this cannot be realised without the required political will and the newly elected central government must implement such a programme on priority basis. The political parties should incorporate the demand for having an urban employment guarantee scheme in their election manifesto. Read More: Educated? Skilled? Sorry, No Jobs!